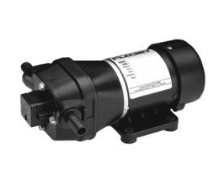 Flojet 4300 series pumps are suitable for a wide range of agricultural and industrial applications. With flow rates to 18 LPM and pressure to 45 PSI the 4300 series pump range is suitable for boom spraying as well as application and transfer of many chemicals. The Flojet 4300-342 has an open flow rate of 14 LPM and is fitted with Viton checkvalves and Geolast diaphragms. 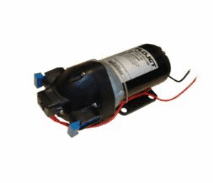 The Flojet 4300 series is a self-priming pump. It is fitted with a pressure switch to provide “on demand” spraying and cut out.